MILWAUKEE (AP) — Triple Crown contender Christian Yelich and the Milwaukee Brewers advanced to an NL Central tiebreaker against the Chicago Cubs, putting themselves in that position Sunday with an 11-0 romp over the Detroit Tigers. The Brewers will play the Cubs at Wrigley Field on Monday in a one-game matchup for the division title. The loser will host the NL wild-card game Tuesday vs. the loser of the Colorado-Los Angeles Dodgers tiebreaker in the NL West. The Brewers won their seventh in a row, and Chicago beat St. Louis 10-5 on the final scheduled day of the regular season. Yelich went 0 for 2 with two walks and scored twice, ending his 10-game hitting streak. 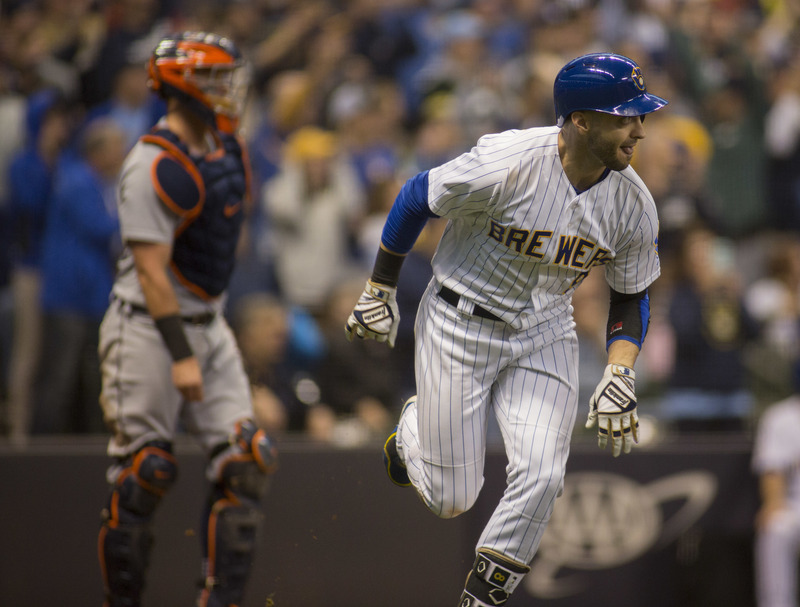 He is hitting .323 in his first season with Milwaukee, locking up the first batting title in Brewers’ history. Yelich has 109 RBIs, tied with Colorado’s Nolan Arenado and two behind leader Javier Baez of the Cubs. Yelich’s 36 home runs are tied with Colorado’s Trevor Story and St. Louis’ Matt Carpenter, one behind Arenado. The tiebreakers are considered game No. 163 of the regular season, meaning Yelich’s stats — and those of Arenado and Baez — from Monday’s game will count in the totals. The last NL player to win the Triple Crown was Joe Medwick in 1937 for the Cardinals. The Brewers (95-67) already had secured their first playoff appearance since 2011, the last time they won the NL Central. Robin Yount, Milwaukee’s two-time AL MVP and Hall of Famer, was on hand to cheer for Yelich. Yount came the closest (.331) to the batting title in 1982 but finished a decimal point behind Kansas City Royals’ Willie Wilson (.332). The partisan crowd of 41,848 at Miller Park serenaded Yelich with “MVP! MVP!” when he went to right field in the top of the first and then came to bat in the bottom of the frame. Yelich walked and scored on Jesus Aguilar’s single in the first, struck out swinging in the third and fifth and was walked intentionally in the seventh as the fans booed the move. He came out of the game in the eighth to a thunderous ovation. Yelich tipped his cap just before ducking into the dugout as the crowd roared its approval. Hernan Perez took his place in the outfield. Gio Gonzalez (10-11) toiled efficiently through five scoreless innings in his fifth start since being acquired on Aug. 31 from Washington. The left-hander, who helped the Nationals win four division titles in the last six seasons, scattered three hits. Aguilar hit his 35th homer, connecting in the fourth off Spencer Turnbull (0-2). Aguilar added an RBI grounder in the seventh. The Brewers, who went 86-76 last year, scored six times in the seventh. Ryan Braun and Orlando Arcia had two-run doubles. Travis Shaw hit his 32nd home run in the eighth. The Tigers, under first-year manager Ron Gardenhire, lost their fifth in a row and finished 64-98 for the second consecutive season. Gardenhire, who previously managed the Minnesota Twins (2002-2014), replaced Brad Ausmus.